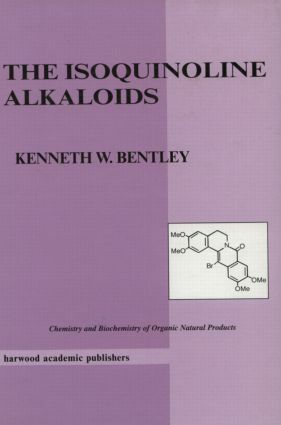 The Isoquinoline Alkaloids presents an in-depth review of 22-sub groups of isoquinoline alkaloids all related to their common origin from the amino-acids phenylalanine and tyrosine. The coverage is not intended to be comprehensive and encyclopaedic, but all of the salient features of the elucidation of structures, structural variation, stereochemistry, chemical reactions, syntheses, biogenetic origins and relationships, and pharmacology are covered, and an extensive bibliography of original papers is provided to assist further detailed study. The opening chapter comprises a review of the formation of alkaloids from amino-acids and the general methods of structural degradation used in the definitive elucidations of structures. Two final chapters cover napthylisoquinolines, which are biogenetically distinct from those discussed in earlier chapters, and miscellaneous natural products that are rationally included with other groups. This book should be of interest to graduates and researchers in the field of organic chemistry, natural product chemistry and biochemistry.